Known as "The Spanish Village by the Sea," the city of San Clemente offers a magnificent coastline and beautiful beaches. With it's perpetual sunny weather and perfect waves, San Clemente is a surfer's paradise with it's beaches also ideal for swimming, body-boarding, hiking, volleyball, whale watching, fishing, surfing and diving. 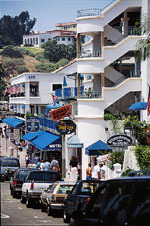 Within our pages you will find San Clemente entertainment and San Clemente attractions. We proudly showcase the finest San Clemente shopping and San Clemente services to suit every lifestyle. For San Clemente dining, we have a list of great restaurants either in the city or near by . We are also dedicated to presenting the best of San Clemente business and professional services to meet your needs. If you're interested in the history of San Clemente, it can be found along with San Clemente general information, San Clemente educational resources plus San Clemente real estate and housing information for both residents and visitors alike. Annual events in San Clemente and links to local organizations in San Clemente are listed so you may participate in all the city has to offer.